We’d love your help. Let us know what’s wrong with this preview of The Search for Delicious by Natalie Babbitt. The Prime Minister is compiling a dictionary, and when no one at court can agree on the meaning of "delicious," the King sends his twelve-year-old messenger, Gaylan, to poll the citizenry. Gaylan soon discovers that the entire kingdom is on the brink of civil war, and must enlist help to define "delicious" and save the country. To ask other readers questions about The Search for Delicious, please sign up. I read this book as part of a "literary discussion group" for my 5th grader's class. Each week the kids got together and discussed the reading. They had weekly assignments as well as a "discussion worksheet" that they filled out to help promote discussion. It was pretty cool to see these fifth graders start down the path of analyzing and really thinking about the books they were reading. Tons of fun. As to the book, it's an entertaining read with some interesting themes and principles. The high l I read this book as part of a "literary discussion group" for my 5th grader's class. Each week the kids got together and discussed the reading. They had weekly assignments as well as a "discussion worksheet" that they filled out to help promote discussion. It was pretty cool to see these fifth graders start down the path of analyzing and really thinking about the books they were reading. Tons of fun. As to the book, it's an entertaining read with some interesting themes and principles. The high level summary is that the prime minister in a kingdom is trying to write a dictionary for the kingdom. With each definition, he provides an example. He's reached the word "Delicious" and everybody has a different opinion as to what truly exemplifies the word....apples, nuts, pies, etc. So, the young hero Gaylen is sent out into the kindgom to take a survey of every citizen and determine, by majority, what is the most delicious. The disagreements within the castle prove to have just been a microcosm of the kingdom at large and it quickly becomes evident that there won't be any common consensus. Added to the "delicious" problem, we have a power hungry man riding around the country stirring up trouble in hopes of eventually getting the kingdom for himself. An intriguing parallel story thread starts with a prologue in which we're given definitions of mystical/magical creatures who still exist but have been forgotten or ignored by humans. We're presented the story of a mermaid named Ardis who had a magical key that opened and closed the door of a house at the bottom of a lake. The key was taken from her by a human and has been lost forever. Throughout Gaylen's journey across the kingdom, he learns more about these mythical beings and the part they may still play in the kingdom. Overall, this was a fun and entertaining story. It's a simple tale easily accessible to children. And yet it has some themes and ideas that could be engaging to adults as well. It makes a point of showing how silly some of our arguments become and how outrageous our behavior is. It touches on the concepts of the creativity and imagination that's often lost as we transition from youth to adult. This is a fun fairy tale that can be enjoyed together by parents and children. Babbitt can do better, iirc. But even young me would have found the problem, and the solution of the quest, ridiculous. And some kids might get the impression that the world is even scarier than it really is, because adults are even stupider than they really are. Still, some lovely bits, an enchanting vibe, and delightful pen & ink drawings by the author. I didn't realize how much I was hankering for a good old-fashioned fairy tale until I started reading this book. There was so much I loved about "The Search for Delicious." "There was a time once when the earth was still very young, a time some call the oldest days. This was long before there were any people about to dig parts of it up and cut parts of it off. People came along much later, building their towns and castles (which nearly always fell down after a while) and plaguing each other with I didn't realize how much I was hankering for a good old-fashioned fairy tale until I started reading this book. There was so much I loved about "The Search for Delicious." "There was a time once when the earth was still very young, a time some call the oldest days. This was long before there were any people about to dig parts of it up and cut parts of it off. People came along much later, building their towns and castles (which nearly always fell down after a while) and plaguing each other with quarrels and supper parties. The creatures who lived on the earth in that early time stayed each in his own place and kept it beautiful. There were dwarfs in the mountains, woldwellers in the forests, mermaids in the lakes, and, of course, winds in the air." I learned delicious is sometimes more about who you are sharing the experience with rather than what you are eating. I enjoyed the writing style a lot more than I expected. While the premise seems ridiculous, the story had more substance than just adults being stupid. It showcased how propaganda could lead to rebellion and civil war. I also liked the ancient beings and their resulting indifference to the people around them. Gaylen didn’t grow much as a character, but he wasn’t annoying, which is a plus! I really liked The Search for Delicious it was funny and exciting . Twelve year old Gaylen is an assistant to the Prime Minister in a fantastical medieval era England. The king, on the recommendation of his PM, chooses Gaylen to go on a journey to survey all the kingdom's residents, asking them what's the most wonderful food they can think of. The most common answer will be chosen as the synonym / definition of delicious in the kingdom dictionary. Problem is, no two people seem to give Gaylen the same answer, so how is he to choose? While on his journey, Gaylen Twelve year old Gaylen is an assistant to the Prime Minister in a fantastical medieval era England. The king, on the recommendation of his PM, chooses Gaylen to go on a journey to survey all the kingdom's residents, asking them what's the most wonderful food they can think of. The most common answer will be chosen as the synonym / definition of delicious in the kingdom dictionary. Problem is, no two people seem to give Gaylen the same answer, so how is he to choose? While on his journey, Gaylen uncovers some issues far more serious than food. He gets word of someone close to the king planning to overthrow him. Doesn't take long for everything in Gaylen's life to start running amok! A wonderful tale about how everyone can come together and agree on something, even if originally they disagreed. In this story, Gaylen, a young boy, is sent to poll the kingdom on what the meaning of delicious is. Since everyone has a different opinion, fights often break out. But in the end, it's someone who previously had no voice that makes a difference, just by sharing the joy of water. And after reading this and thinking about a long drive I had yesterday, it's very true. Nothing is more de A wonderful tale about how everyone can come together and agree on something, even if originally they disagreed. In this story, Gaylen, a young boy, is sent to poll the kingdom on what the meaning of delicious is. Since everyone has a different opinion, fights often break out. But in the end, it's someone who previously had no voice that makes a difference, just by sharing the joy of water. I really enjoyed the fantasy and fairy tale elements and how the plot progressed. The writing was also lovely and embodied the fairy tale atmosphere. I don't really have much to say about this book other than that it was a fun read, but I felt that the cause and catalyst for the progression of the plot was a little too silly for me. I would highly recommend this to any child or middle grade reader. A nice fun little story with a delightful quirkiness and intriguing plotting, but somehow a little lackluster. Overall, a nice read. We read this once for third grade Language Arts, and I thought it was the one of the greatest books in the world. I still love this book, it is definitely one to read again and again. I enjoyed Natalie Babbitt's fantasy about a kingdom where mythological creatures hide away from ignorant and contentious humans and where a 12-year-old boy bridges the divide. The orphan Galen loves the Prime Minister who raised him and is a loyal subject of the King, so he doesn't hesitate when the King bids him take a poll of everyone in the Kingdom about what is the most delicious thing in the world. He soon learns that in his land there is no tolerance for diversity of tastes. No one can agre I enjoyed Natalie Babbitt's fantasy about a kingdom where mythological creatures hide away from ignorant and contentious humans and where a 12-year-old boy bridges the divide. The orphan Galen loves the Prime Minister who raised him and is a loyal subject of the King, so he doesn't hesitate when the King bids him take a poll of everyone in the Kingdom about what is the most delicious thing in the world. He soon learns that in his land there is no tolerance for diversity of tastes. No one can agree on what's most delicious, and nearly all residents get angry in defending their view. Francesca Forrest I haven't read this in decades, but have a vivid memory of some bits, especially the conclusion. I wonder how it would seem to me now. CarolineFromConcord I thought it got off to a slow start, but the boy is so sweet. You care what's going to happen with him. Fried fish! Delicious? I think not. Every person had a different opinion. So exactly what is delicious? In the search for delicious, 12-yo Gaylen sets off on a quest, which of course consists of a series of adventures. One take-home lesson: Wars can start because of misunderstandings and/or for ridiculous reasons. This was a lovely and enjoyable read, but nothing about it really wowed me. I really liked the writing style and the way the story was told, but I don’t see this book really sticking with me in any significant way. I’d recommend it to someone who’s looking for a short and sweet fantasy, and to most younger readers who like fantasy/adventure quest stories. "Good luck, Gaylen, and I'll send my cockatoo after you with the news each Wednesday and Saturday." I loved this book when I was a kid, and, really, what's not to love? A boy on a quest, mythical creatures, a magic spring, and the happiest of endings -- all make for worthwhile adventure. But beyond that, the book illustrates all the worst and best of human behavior, suspicion and kindness, anger and innocence, and the consequences of letting fear dictate our thoughts and actions. A war begun for silly reasons is as destructive and dangerous as a war begun for a righteous cause. Or maybe the le I loved this book when I was a kid, and, really, what's not to love? A boy on a quest, mythical creatures, a magic spring, and the happiest of endings -- all make for worthwhile adventure. But beyond that, the book illustrates all the worst and best of human behavior, suspicion and kindness, anger and innocence, and the consequences of letting fear dictate our thoughts and actions. A war begun for silly reasons is as destructive and dangerous as a war begun for a righteous cause. Or maybe the lesson is that all wars are fought for ultimately silly reasons? This book is one of the best things I read as an older child. I picked it up once out of a box of books a neighbor had given us when they moved. I figured it would just be a quick read to occupy my time during a long summer. However, I was quite surprised by what it held inside. The Search for Delicious is the tale of a nation torn apart by a simple definition. They are creating a dictionary for their nation to use and while things had gone fine for a while, the definition of "delicious" had cre This book is one of the best things I read as an older child. I picked it up once out of a box of books a neighbor had given us when they moved. I figured it would just be a quick read to occupy my time during a long summer. However, I was quite surprised by what it held inside. The Search for Delicious is the tale of a nation torn apart by a simple definition. They are creating a dictionary for their nation to use and while things had gone fine for a while, the definition of "delicious" had created much tension. Some thought chocolate was the definition, while other citizens had conflicting ideas. A young steward is sent through the kingdom to poll for the best definition. However, while he's gone, there is a terrible drought and the kingdom learns the true meaning of what is delicious. If it wasn't for Sister Willburn, I'm sure I would just think this was a fun book with an interesting plot. But since this was one of the books I had to read for English this year, I got to hear all of her wonderful insights on it. Natalie Babbitt's messages about religion and education were really profound(although they reminded me a lot of Ben, ha, ha). Summary: Gaylen, the adopted son of the prime minister, sets off on a journey to poll the kingdom to find out the true meaning of the word "del If it wasn't for Sister Willburn, I'm sure I would just think this was a fun book with an interesting plot. But since this was one of the books I had to read for English this year, I got to hear all of her wonderful insights on it. Natalie Babbitt's messages about religion and education were really profound(although they reminded me a lot of Ben, ha, ha). In The Search for Delicious, the Prime Minister of the kingdom is writing a dictionary. The King approves for it except for "Delicious is fried fish". The kings thinks apple are delicious and the queen thinks Christmas pudding is delicious. Soon, the whole town is arguing about what is the most delicious food. The King decides to send the Prime Minister's son Vaungaylen to go to all the people in the kingdom and take a poll. Vaungaylen does-and he goes through many adventures along the way. I rea In The Search for Delicious, the Prime Minister of the kingdom is writing a dictionary. The King approves for it except for "Delicious is fried fish". The kings thinks apple are delicious and the queen thinks Christmas pudding is delicious. Soon, the whole town is arguing about what is the most delicious food. The King decides to send the Prime Minister's son Vaungaylen to go to all the people in the kingdom and take a poll. Vaungaylen does-and he goes through many adventures along the way. This is a book that my family discovered via an audio recording. We only listened to it once or twice, and for the most part forgot about it. I found it in a used bookstore and picked it up--my siblings were excited too! I just re-read it. It's a very delightful, simply-told story that says a lot about humanity, good and bad. Technically it's exaggerated and would never happen but it's also about what happens all of the time. Like most fairy-tales, I guess. This is a charming, wonderful story. I read this out loud to my family while we were on a long car trip, and everyone enjoyed it. A young boy is charged with a task for his King, and on his journey he meets magical beings and deal with unreasonable people. We had lots of laughs, and there are many touching moments. This is one the kids kept pondering after we were all done with it. What a fabulous little book! This would make a great movie. Gaylen, the Prime Minister's assistant, is assigned the task of polling the kingdom to discover what food is most delicious. This task leads him to meet strange beings and to accomplish something even greater. Enjoy! Thank you, Ms. Keebler, for reading this to us in 2nd grade, with your sparkly red chair and your Tab. Every day, we waited to hear what delicious truly was. And it is. 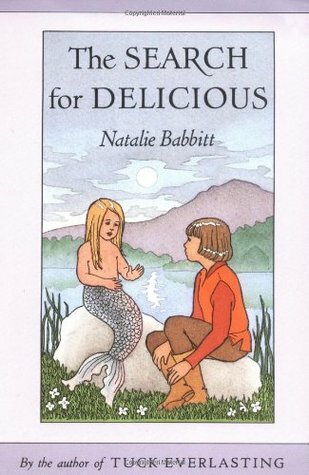 Natalie Babbitt was an American writer and illustrator of children's books. She attended Laurel School for Girls, and then Smith College. She had 3 children and was married to Samuel Fisher Babbitt. She was the grandmother of 3 and lived in Rhode Island. She was a board member of the National Children's Book and Literacy Alliance a national not-for-profit that actively advocates for literacy, liter Natalie Babbitt was an American writer and illustrator of children's books. She attended Laurel School for Girls, and then Smith College. She had 3 children and was married to Samuel Fisher Babbitt. She was the grandmother of 3 and lived in Rhode Island. She was a board member of the National Children's Book and Literacy Alliance a national not-for-profit that actively advocates for literacy, literature, and libraries. “That doesn't sound like civil war to me," said Gaylen, turning back to his book with a smile. "It only sounds silly."